This is guacamole, my way. 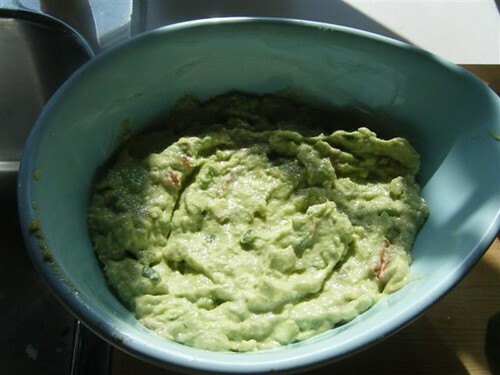 It may offend purists, who insist that guacamole is best when it is avocado and lime juice only, but I have made it this way for years and so far I have had no complaints. Even with the mayo. Trust me, it’s so good. I served this dip for parties and it is eaten with greedy abandon. It is also lovely on top of fajitas or spread inside a whole grain wrap sandwich. The options are only limited by your imagination. I like to mash most of the avocado until it is creamy and smooth, then dice what remains so you have chunks of whole buttery avocado goodness. It is better to let it sit for a few hours, spritzed with lime juice and covered with plastic wrap, but you can eat it right away. Get your corn chips ready!!! In a bowl combine the mayonnaise, cumin, coriander, onion, cilantro, and garlic. Add the flesh of one and a half avocados to the mixture in the bowl and mash well. Take the flesh of the remaining half avocado and dice into 1/4 inch cubes and gently fold into the mixture along with the rotel.